Hi, I was inspired to make this card by a few challenges. 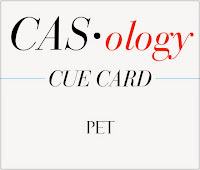 CASology has a a pet theme. It's a spots and dots theme at Simon Says Stamp Wednesday Challenge. At The Card Concept it's a colour challenge. My card is in the clean and layered category. as my little blocks, so I'm popping into the snippets playground again at Pixie's Crafty Workshop. (AAA Cards had a sketch type challenge to use 4 shapes in a window block. That was a main part of my design but our satellite internet connection dropped out and I was too late to enter. Memory Box/Poppy Stamps window, cat ,bird and tiny bow dies; Simon Says Stamp hello die; snippets of dp; wink of stella clear pen; bling from stash. This is very cute...I love how the cat is eyeing up that bird...he has plans for a tasty treat! Absolutely gorgeous! I love your layout and all of those cute little details you've added. Thanks for joining us at The Card Concept! Great combination of these challenges - love the cat silhouettes! So glad you joined us at CASology this week! Brilliant combo of challenges! This is such a cute and clever card! Thanks for playing along with CASology this week! What a fun design :) love the die cuts u used ! What a great card to drop into those challenges! I love the design and especially those little bows!! Cute! Your card made me smile with the cat & bird :) -- ready to pounce! So cute! 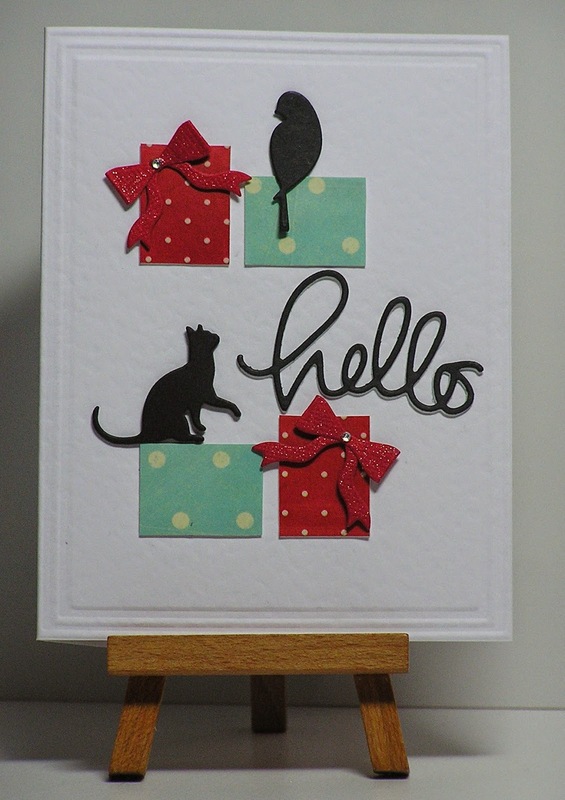 I am sure that kitty is saying more than hello to his birdie friend :) Thank you so much for playing along in the Spots and Dots Challenge over at the Simon Says Stamp Wednesday Challenge Blog with us this week! I love how you used these colors and the blocks from the window die! Hope that kitty doesn't catch the bird! SO fun and cute!!! Love the bird and cat sitting atop those pretty little presents. Precious and very creative. So very cute! I'm betting on the bird! Lovely card. this is a lovely, clean and simple card - love it! What a fun card. I imagine the kitty is saying hello to the birdie and is quite interested in him. So cute.